I was really excited when my friend Hani of Haniela's fame, invited me to collaborate with her on a "sprinkles" post. We have collaborated in the past and it's always a fun time! As you can see, Haniela's made an outstanding Vans sprinkles shoe cake, and I'm in awe! I have been wanting to make a fairy bread cake for quite awhile, and this was the perfect opportunity! 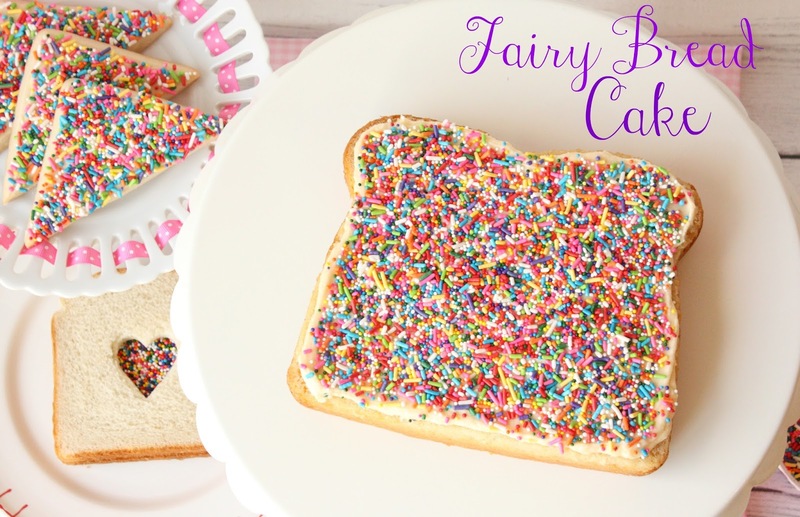 Have you heard of fairy bread? It's a popular, well-loved treat served at children's birthday parties in Australia. 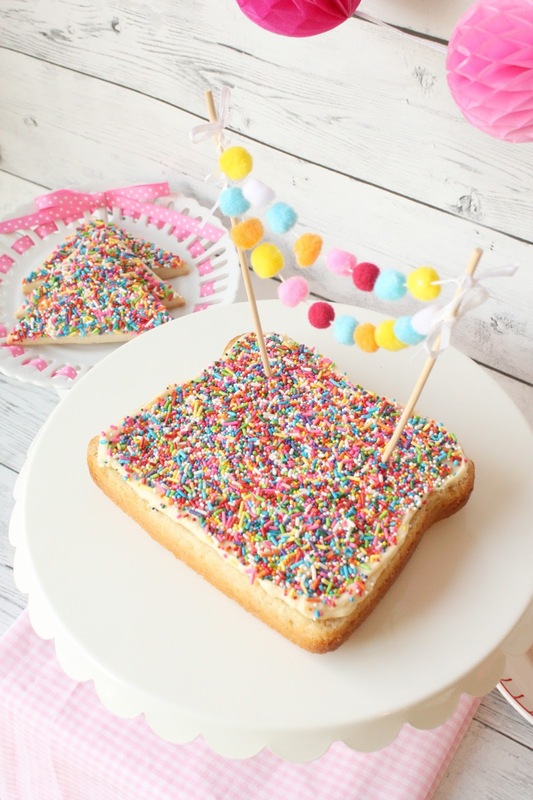 It consists of soft white bread spread with butter, and covered with lots of sprinkles! What's not to love?!? So simple too! I bought a bread shaped cake mold which worked out very well, but I'm sure it would not be too difficult to sculpt the bread shape from cake. Wouldn't this be a fun cake to serve at a birthday party? I love it! I also think it would be perfect at a fairy themed party, or unicorn, or simply for any sprinkle-lover! (I used the pound cake recipe from the back of the Cakewich cake mold box) It made two "bread slices", though I only used one. I am sure two 8-inch square cake pans should work for this recipe. 1. Cream butter in mixer until creamy. 2. Gradually add the powdered sugar until combined. 3. Add vanilla and milk until combined, smooth and creamy. 4. Add a drop of yellow food coloring if you want the frosting to have more of a butter tint for the fairy bread cake (optional). 2. Grease and flour the cake pan. 6. Reduce speed to low and add one-quarter of the flour, then one-third of the milk mixture, mixing until just combined, scraping down the bowl and beater after each addition. Repeat until all ingredients are just combined. 7. Scrape the bowl well with a large rubber spatula. Pour the batter into the (Cakewich) pan(s) and smooth the top. 8. Bake for about 60-70 minutes (may need to modify if using two 8-inch square pans), until a toothpick inserted in the center comes out clean. 9. Cool the cake in the pan on a cooling rack for one hour, then remove from pan to finish cooling right side up. To assemble: 1. I used a serrated bread knife (very appropriate:)) to slice the cake in half horizontally. I used one half for the cake. 2. Spread the frosting liberally on top of the cake to represent butter. 3. Place sprinkles on top of the entire cake. Gently press them onto the frosting. Thanks Hani for the fun collaboration! Don't forget to check out Hani's Vans sprinkle shoe video! It really is a fun pan! Thanks so much, Hani! XO! Thank you, Mariel! Happy baking! Oh my gosh! I thought those were real Vans. What a fun cake. I can't believe how much this looks like a slice a bread! It's so creative and like I told Hani, sprinkles is a great way to collaborate! Thank you, Kim! Yep, I don't think you can go wrong with sprinkles! Thanks, Linda! You Aussies sure came up with a delightful treat! XO! This is a colorful and delicious treat. Thanks for your comment, Christy! The pink vans are soo cute!